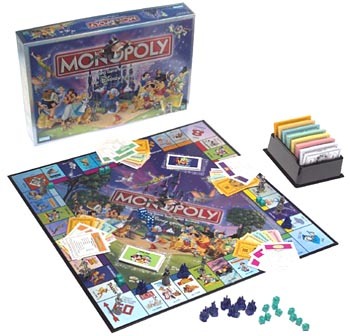 All of your favorite Disney characters are featured in classic Monopoly style for a family game that everyone can enjoy. All of your favorite Disney characters are featured in classic Monopoly style for a family game that everyone can enjoy. You already know how to play, so nothing has changed--except a few things that actually make this version collectible. Solid pewter moving pieces feature Snow White, a coupled Lady & The Tramp, Cinderella, Pinocchio, Dumbo, Alice, and Baboo. Property is represented as a cottage and the Prince's well-known castle. Scrooge McDuck, naturally, is featured on all Monopoly money in place of Rich Uncle Pennybags.